Welcome to my website (prof.irfanessa.com). Here you will find information related to my academic pursuits. This includes updates on my research projects, list of publications, classes I teach and my collaborators/students. If you'd like to contact me, I suggest please see the FAQ. Students wanted to contact me about working with me are highly encouraged to read the FAQ. My bio is also available. Use the menu bar above, or the TAGS and CATEGORIES listed in the columns to find relevant information. Purpose: Routine evaluation of basic surgical skills in medical schools requires considerable time and effort from supervising faculty. For each surgical trainee, a supervisor has to observe the trainees in- person. Alternatively, supervisors may use training videos, which reduces some of the logistical overhead. All these approaches, however, are still incredibly time consuming and involve human bias. In this paper, we present an automated system for surgical skills assessment by analyzing video data of surgical activities. Method : We compare different techniques for video-based surgical skill evaluation. We use techniques that capture the motion information at a coarser granularity using symbols or words, extract motion dynamics using textural patterns in a frame kernel matrix, and analyze fine-grained motion information using frequency analysis. Results: We were successfully able to classify surgeons into different skill levels with high accuracy. Our results indicate that fine-grained analysis of motion dynamics via frequency analysis is most effective in capturing the skill relevant information in surgical videos. Conclusion: Our evaluations show that frequency features perform better than motion texture features, which in turn perform better than symbol/word-based features. Put succinctly, skill classification accuracy is positively correlated with motion granularity as demonstrated by our results on two challenging video datasets. A fully automated framework for video-based surgical skill assessment is presented that incorporates the sequential and qualitative aspects of surgical motion in a data-driven manner. The Objective Structured Assessment of Technical Skills (OSATS) assessments is replicated, which provides both an overall and in-detail evaluation of basic suturing skills required for surgeons. Video analysis techniques are introduced that incorporate sequential motion aspects into motion textures. Significant performance improvement over standard bag-of-words and motion analysis approaches is demonstrated. The framework is evaluated in a case study that involved medical students with varying levels of expertise performing basic surgical tasks in a surgical training lab setting. Awarded the Best Paper Honorable Mention (2nd place) Award at M2CAI 2014. Presented at Fifth Workshop on Modeling and Monitoring of Computer Assisted Interventions (M2CAI) held in conjunction with Medical Image Computing and Computer Assisted Intervention (MICCAI) 2014 Conference in Boston, MA, USA on September 14th, 2014. The assessment of surgical skills is an essential part of medical training. The prevalent manual evaluations by expert surgeons are time consuming and often their outcomes vary substantially from one observer to another. 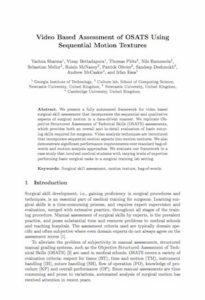 We present a video-based framework for automated evaluation of surgical skills based on the Objective Structured Assessment of Technical Skills (OSATS) criteria. We encode the motion dynamics via frame kernel matrices, and represent the motion granularity by texture features. Linear discriminant analysis is used to derive a reduced dimensionality feature space followed by linear regression to predict OSATS skill scores. We achieve statistically significant correlation (p-value < 0.01) between the ground-truth (given by domain experts) and the OSATS scores predicted by our framework. Li and Chanho Kim and Hrishikesh Rao and Jonathan C.
We introduce a new problem domain for activity recognition: the analysis of children’s social and communicative behaviors based on video and audio data. We specifically target interactions between children aged 1-2 years and an adult. Such interactions arise naturally in the diagnosis and treatment of developmental disorders such as autism. We introduce a new publicly-available dataset containing over 160 sessions of a 3-5 minute child-adult interaction. In each session, the adult examiner followed a semi-structured play interaction protocol which was designed to elicit a broad range of social behaviors. We identify the key technical challenges in analyzing these behaviors, and describe methods for decoding the interactions. We present experimental results that demonstrate the potential of the dataset to drive interesting research questions, and show preliminary results for multi-modal activity recognition. via IEEE Xplore – Decoding Children’s Social Behavior. We present data-driven techniques to augment Bag of Words (BoW) models, which allow for more robust modeling and recognition of complex long-term activities, especially when the structure and topology of the activities are not known a priori. Our approach specifically addresses the limitations of standard BoW approaches, which fail to represent the underlying temporal and causal information that is inherent in activity streams. In addition, we also propose the use of randomly sampled regular expressions to discover and encode patterns in activities. We demonstrate the effectiveness of our approach in experimental evaluations where we successfully recognize activities and detect anomalies in four complex datasets. via IEEE Xplore – Augmenting Bag-of-Words: Data-Driven Discovery of Temporal and Structural Information for Activity R…. At ACM sponsored, 14th International Conference on Ubiquitous Computing (Ubicomp 2012), Pittsburgh, PA, September 5 – 7, 2012. Here are the highlights of my group’s participation in Ubicomp 2012. E. Thomaz, V. Bettadapura, G. Reyes, M. Sandesh, G. Schindler, T. Ploetz, G. D. Abowd, and I. Essa (2012), “Recognizing Water-Based Activities in the Home Through Infrastructure-Mediated Sensing,” in Proceedings of ACM International Conference on Ubiquitous Computing (UBICOMP), 2012. [PDF] [WEBSITE] (Oral Presentation at 2pm on Wednesday September 5, 2012). J. Wang, G. Schindler, and I. Essa (2012), “Orientation Aware Scene Understanding for Mobile Camera,” in Proceedings of ACM International Conference on Ubiquitous Computing (UBICOMP), 2012. [PDF][WEBSITE] (Oral Presentation at 2pm on Thursday September 6, 2012). In addition, my colleague, Gregory Abowd has a position paper on “What next, Ubicomp? Celebrating an intellectual disappearing act” on Wednesday 11:15am session and my other colleague/collaborator Thomas Ploetz has a paper on “Automatic Assessment of Problem Behavior in Individuals with Developmental Disabilities” with his co-authors Nils Hammerla, Agata Rozga, Andrea Reavis, Nathan Call, Gregory Abowd on Friday September 6, in the 9:15am session.